For many years SPAN had professed an ambition to become involved in a large scale comprehensive development. With the financial assistance of The Royal London Mutual Insurance Society Ltd, a plot of land that had once formed part of both North Ash Farm and New House Farm was bought in 1961. The name New Ash Green was derived from these two farms. Planning permission was initially refused in 1963. The Kent County Council stated that they believed provision for new housing in Kent was already being made. Kent County Council said the land was of agricultural value and that local transport could not cope with increased demand. Most significantly it was perceived that New Ash Green would be built on Green Belt land, although the site was actually situated on land within a proposed extension of the Green Belt. There was also local opposition to SPAN’s intentions. SPAN appealed against the decision and a public enquiry was held. In 1964 the new Labour Minister of Housing and Local Government Richard Crossman (on the recommendation of his Parliamentary Secretary) rescinded the decision of his predecessor and granted planning permission for the building of New Ash Green. Crossman said, ‘This may well be a model of how to get civilised modern community living in an area of beautiful landscape’. Statement from SPAN publicity brochure 1967, ‘This Village is planned as a ‘whole’ place created for Twentieth Century living and providing for Twentieth Century people’s needs’. New Ash Green, ‘The Latter Twentieth Century in Kent’ is to be found on the North Downs between Hartley and Ash. Of the 429 acres that comprised New Ash Green only 190 would be built upon. The Village would be built between 1966 and 1971 and provide homes for 5000 to 6000 people. SPAN were aiming to achieve a ‘social balance’ attracting people of different ages and backgrounds. 450 of the proposed 2000 houses to be built in New Ash Green were to be allocated to Greater London Council tenants. Provision for the offices, studios, shops and light industries would generate some local employment. The nineteen ‘neighbourhoods’ of New Ash Green were to be composed of 100 to 150 houses built in varying densities. As a low-density neighbourhood, Redhill Wood was composed of fifty individual plots for owner-built houses. These houses would be designed architects from SPAN’s Select Panel. The names of the neighbourhoods were taken from the field names that appeared on the old tithe map of Ash Parish as well as historic events and figures associated with the area. Kentish terms such as ‘minnis’ meaning common land or open space and ‘went’ meaning path or way, were adopted. The neighbourhoods were designed along ‘Radburn’ lines which separated the roads from the pedestrian paths. All the houses would face or back onto a common green, certain residents may have had common greens at the back and front and back of their properties. As well as the housing, Eric Lyons and Partners were to design the Village’s public and county buildings including the shopping centre, offices, community centre, church, library, clinic and primary school. The Residents’ Society: SPAN created a two tier system of management for New Ash Green. Every neighbourhood had it’s own Residents’ Society with the shopping centre having a Centre Society. Each Residents’ Society would have a Committee of Management comprising of Treasurer, Secretary and six other Committee members. Of the six committee members a Chairman and Vice-Chairman would be elected. Members of the Committee would have the responsibilities of co-ordinating the management and the maintenance of their neighbourhood. Members of the Committee would be delegated specific duties. These duties could include the maintenance of the common greens, roads, paths, car-parks, lighting and coordinate the four-yearly repaint. All householders were bound under under their terms of purchase to buy a share and become a member of the Residents’ Society and comply with regulations of the Covenants and Byelaws. These regulations specified that no alteration to the external appearance of your house, walls, fences, common greens and landscaping could be made without prior consent. No external aerials were permitted. An annual subscription had to be paid to the Residents Society, the sum of which was based on the size of your property. ‘Nothing shall be done or omitted to be done that may interfere with the enjoyment of amenity by other persons’,Schedule E, Byelaws (10). Statement from SPAN publicity brochure 1967, ‘The Association is responsible for maintaining the private roads, the playing fields and community buildings and The Minnis and all the Village grounds’. The Village Association formed the second management tier of New Ash Green. The Chairman of each neighbourhood Residents’ Society were known as Representative Members. One of these Representative Members would perform the dual role of Chairman of the Village Association. The work of the Village Association is directed by the Council of Management. The Council is composed of six Representative Members and three consultant members (who are qualified in architecture, landscaping, planning, estate management or an associated field). The Amenity Committee, consisting of six Consultant Members appointed by the Council, was given overall responsibility for assessing proposed alterations to buildings, landscaping, roads, paths, walls, fencesor layout. In 1967 SPAN produced a publicity brochure that described the ‘concept’ and benefits of living in New Ash Green. ‘New Ash Green could well be for you, the place in which to discover a richer way of life. A rewarding feeling of community, yet with space and freedom for the private enjoyment of country things like fields and woods which (rare pleasure) you will have have a perfect right to use’. 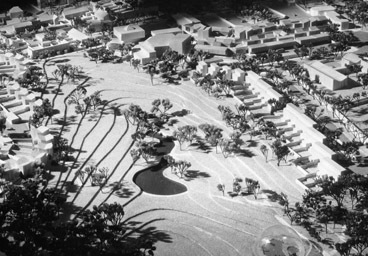 ‘The Village is planned as a whole place, created for Twentieth Century living and providing Twentieth Century people’s needs’. ‘As the cities threaten to burst at the seams with overcrowding and traffic congestion, or become so massive as to dwarf humanity, there is a desperate longing for a return to the country, perhaps, among people who want to bring up children in a healthier, safer and more attractive environment, and people who value the calm and sense of belonging which country living promises’. ‘It is difficult to find a home in a country place that is at once reasonably priced; not too isolated or far from your work; in beautiful surroundings; and within easy reach of shops,schools and other necessities. Faced with these obstacles, most people come to the conclusion that there hopes are for dreaming purposes only; that there is no actual solution to the problems. SPAN have created the Village to provide the long needed solution’. The ‘K-range’ of houses (K for Kent), designed specifically for New Ash Green were advanced not only in terms of appearance but also in their use of materials and method of construction. The houses were built of brick flank and party walls, a central steel ‘A’ frame and horizontal ‘purlins’. The walls, front and back, first storey floor and roof were constructed of prefabricated panels. These panels were brought into position by the on-site crane and were then attached to the steel ‘A’ frame and horizontal ‘purlins’. The houses were constructed by ‘Building SPAN’ who had earlier built Templemere and Grasmere (the New Ash Green prototype houses). Eric Lyons spoke of the ‘K-range’ in 1968, ‘The structure is based on a simple principle of a centre frame containing four metal columns that house the staircase trimming, the heating, services etc. - all standardised. We have produced from this basic core house a method of construction consisting of large preformed timber roof panels, wall panels and roof panels. The panels are made in the factory on the site’. The colour interior photographs were taken inside the K2A show house at Grasmere. The Grasmere and New Ash Green show houses on Over Minnis at New Ash Green were all furnished by Dunn’s of Bromley.be used for) and it looks good even in Winter’. 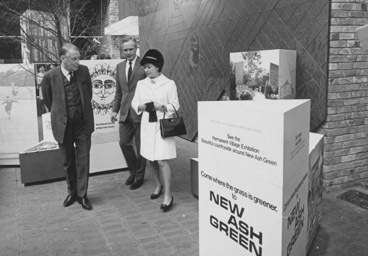 At Home’ September 21st, 1967 The official launch of New Ash Green was held on September 21st, 1967. Inaugural speeches were given by Sir Keith Joseph, Ernest Haynes (Chairman of SPAN Kent Ltd.) and Leslie Bilsby (Joint Managing Director of SPAN Developments Ltd.). 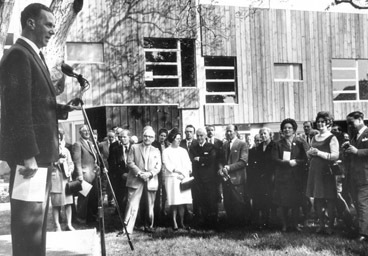 The audience was comprised of local authority dignitaries and officers, estate agents, press and a select number of future residents.Ernest Hayes stated that the project depended on,‘inspiration and sheer hard work combined with patience and a lot of good luck’. Keith Joseph said that he had no part in the decision to build New Ash Green, but was delighted to accept it’s inevitability. Ironically Keith Joseph had been the former Minister of Housing who had accepted his inspectors decision and refused planning permission for New Ash Green back in 1963. Span launched the New Ash Green concept at the Ideal Home Exhibiton. A model of the village plan and the surrounding landscape environment. The official launch of New Ash Green. Sir Keith Joseph giving one of the inaugural speeches.